I almost thought about saving this for Father’s Day but, naw. The above comic strip (created by CutnEdge Cartoons) is impressive in the forms of the art itself but more importantly, what it represents. The circle of life continuing again and again and again with love. I am very sure everyone, anyone who read the strip, reading what I am typing lost a loved one this year, or maybe this month. Beyond a year or maybe a few days ago? Our children, offspring must be taught the very lessons that guided us through childhood and mostly as adults. I believe the good and the bad needs to be explain along with open ended questions hopefully coming forth from the child. Even through faults of our own, if we are coming with love we will receive it back. If we are coming with honestly our words will cling with them to the very end. I am never surprise to the grief one carries from losing a person who they loved greatly to the point that breathing would become a chore. The crazy thing though, they will never leave you if you still remember them. They will never forsake you if you cherish those moments that you remember of them that made you feel so good. They will always cling to that wisdom because it came from a loving place, and guided to you by honesty. So in this reference fathers; all fathers love you children. 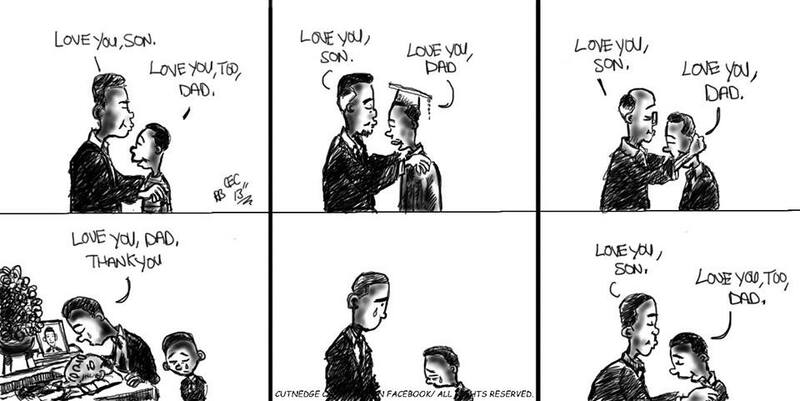 Love your sons and pass it down for other generations to share in such commitment and reliance. I especially loved how the comic illustrated the cycle that love can create, and how a father’s love can influence and have lasting effects on his children. It definitely stressed the importance of telling your children those three words. A great share, and your comments really added volumes to it. I haven’t lost anyone this year, but I have lost loved ones, and you’re right, if all you do is remember them and those things they’ve taught you, then they’re never really lost. Yes the strip added so much. I know it talks to everyone who loss someone dear to them. I’m sorry for you past goodbyes, I had a few in the past 2 yrs. You are ever so right about those 3 words, I really try to tell my lil’ one that every time I hold her. Just those words means a lot. I remember them clearly at times when I was young. Thank you for sharing your wisdom, greatly appreciated.. I like this too. I like the message. More technically, I like the clever way the artist ages the characters while making them look like the same individual. Of course we should remember that often the message isn’t “Love you, Dad” (or Mum or whatever, but “Hate you, son” – and that gets repeated too. There is not way I can express how amazing that cartoon is. right on, appreciate you taking the time to visit..